It is not uncommon to see, from time to time, the cries from innocent users that their FT232RL based devices with counterfeit chips are bricked by official driver update. One way to avoid the threat of counterfeits is to purchase from solid vendors, and we want to be one of them. Here are the procedures by which we followed so we can assure that the chips we sell are genuine. Chips are sourced from vendors who we have been doing business with for years. Some of them are official distributors and some of them are specialized to handle factory surplus. We visually check each chip to see if they are from the same batch. We pick 5% percent from the total batch and decap the epoxy. We visually check each silicon die of the samples under a microscope to see if they are identical with the known genuine chip. Seeing is believing. 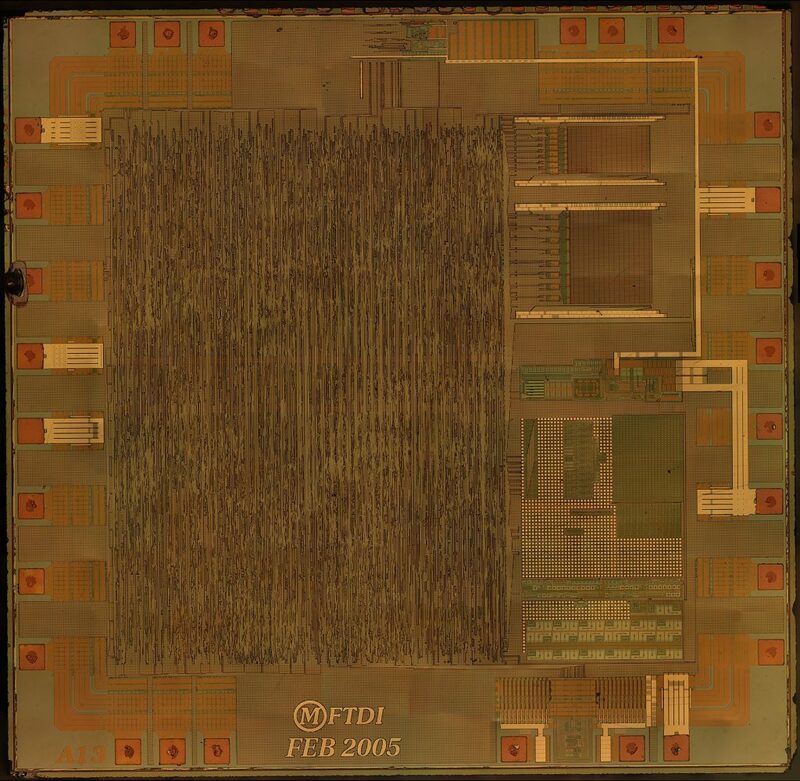 We publish the silicon die shot on the product description page so you can see what is inside the chip and you decide whether to purchase it or not. Here comes the die shot from 1 sample in 30pcs batch. In the link above you can find die shots in the resolution of 18000×17565, 10000×9758, and 5000×4879. The most high-resolution picture we took for this product is 32597×31810 and it was stitched from 150 pictures took by a SLR. The most high-resolution picture will not be released to the public. if you are interested in it, please submit a contact form. If you need a cross reference of the die shot, here is the place to go. Sandbox Electronics is a studio that design electronics and sell these bits and pieces worldwide. We are proud of our geeky culture at Sandbox Electronics and would love to share our experiences and fun stories online.